During the same period, the world’s population is expected to increase considerably. As a result, the percentage of the world’s population that is Buddhist is forecast to decrease from about 7% in 2010 to 5% in 2050. 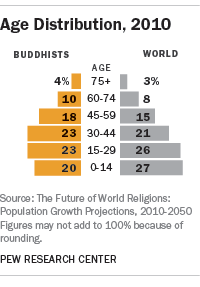 The projected decline in the share of the world’s population that is Buddhist is a result of Buddhists’ aging population and low fertility rate relative to other religious groups. The annual growth rate of the world’s population is expected to decline gradually in the coming decades, falling from 1.1% in 2010-2015 to 0.4% between 2045 and 2050. 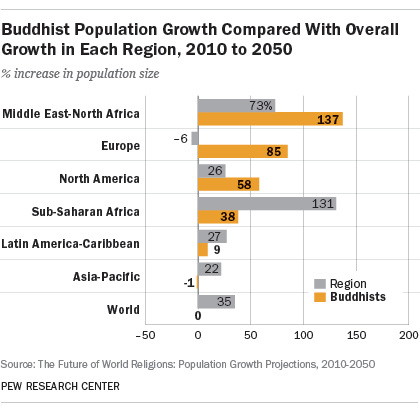 The annual growth rate of Buddhists also is expected to decline. The Buddhist growth rate is 0.5% in 2010-2015. After 2030, the growth rate of the global Buddhist population is forecast to enter negative territory, ending with a negative rate of growth in 2045-2050 of minus 0.4%. This represents a projected decline in the Buddhist population after 2030. Buddhists are expected to remain very heavily concentrated in the Asia-Pacific region, where 99% of Buddhists lived in 2010 and a similarly high proportion (98%) are projected to reside in 2050. The share of the world’s Buddhist population living in North America is expected to grow from about 0.8% in 2010 to 1.2% in 2050. Europe and the Middle East-North Africa region also are expected to see very slight increases in their shares of the global Buddhist population. Although the Asia-Pacific region will remain home to the overwhelming majority of Buddhists in the coming decades, the Buddhist population in the region is projected to decline, both in absolute number and as a share of the overall population in Asia and the Pacific. In 2010, Buddhists made up about 12% of the region’s population. 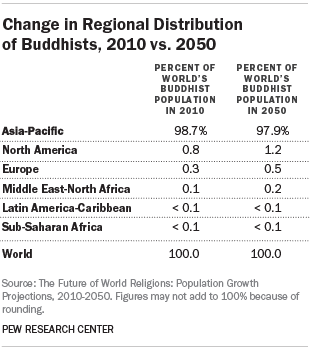 By 2050, Buddhists are projected to make up about 10% of the region’s inhabitants. 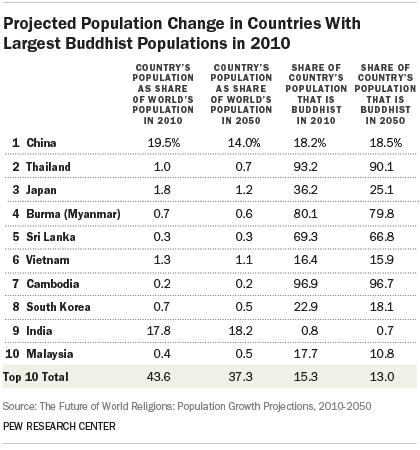 Over the same period, the number of Buddhists in the region is expected to drop from 481 million to about 476 million. 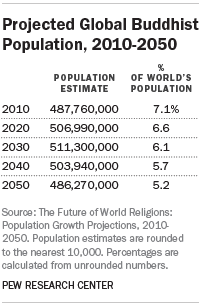 In all other regions, Buddhist populations are projected to increase in absolute number. In North America, for example, the Buddhist population is projected to grow by more than 2 million, from 3.9 million in 2010 (or 1.1 % of North America’s population) to nearly 6.1 million in 2050 (1.4% of North America’s population). 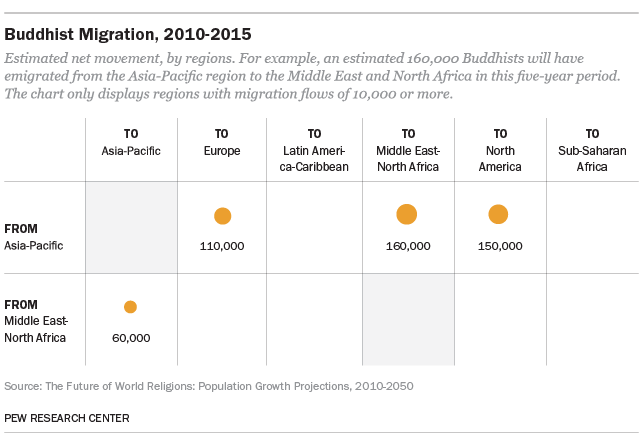 At the same time, the Buddhist populations in Europe and the Middle East-North Africa region are expected roughly to double. Europe’s Buddhist population is anticipated to be 2.5 million in 2050 (or 0.4% of Europe’s total population), while Buddhists in the Middle East and North Africa are forecast to number 1.2 million (0.2% of the region’s population). Buddhist populations in Latin America and the Caribbean as well as sub-Saharan Africa are expected to remain relatively small. Between 2010 and 2050, the most rapid Buddhist population growth, in percentage terms, is projected to occur in the Middle East and North Africa. Driven largely by immigration, the region’s Buddhist population is expected to more than double in size (growing by 137%), while the region’s overall population is expected to increase by 73%. The second-fastest growth among Buddhists is anticipated in Europe (85%), where, by contrast, the overall population is expected to decline between 2010 and 2050. The Buddhist population also is projected to grow at a faster rate than the overall population in North America (58% vs. 26%). In the Asia-Pacific region, the number of Buddhists is expected to decline slightly between 2010 and 2050, while the region’s overall population is expected to grow by 22%. Most of the countries with the largest numbers of Buddhists as of 2010 are expected to see their overall populations decline as a share of the world’s population. Collectively, these countries held 44% of the world’s population in 2010. By 2050, their share of the global population is expected to decline to 37%. China is expected to go from having nearly 20% of the world’s population in 2010 to 14% in 2050. The proportion of China’s population that is Buddhist is expected to remain around 18% between 2010 and 2050. But in many other countries with large Buddhist populations, the Buddhist share of the population is expected to decline in the decades ahead, because Buddhists tend to be older and have fewer children than non-Buddhists.46 In Japan, for example, the Buddhist share of the population is forecast to drop by more than 10 percentage points, from 36% in 2010 to 25% in 2050. By a wide margin, China, with a Buddhist population of 244 million, had the most Buddhists living within its borders in 2010. In fact, about half of the world’s Buddhists in 2010 lived in China, though only about one-in-five Chinese people (18%) were Buddhist. The 10 countries with the most Buddhists in 2010 – home to a combined 94% of the world’s Buddhists – were all in Asia, including Thailand (64 million), Japan (46 million), Burma (38 million) and Sri Lanka (14 million). As was the case in 2010, the overwhelming majority of Buddhists in 2050 will be found in the 10 countries with the largest Buddhist populations (93%). China and Thailand are expected to remain atop the list. Burma (Myanmar) is projected to have the third-largest Buddhist population in 2050 (45 million), surpassing Japan (27 million). 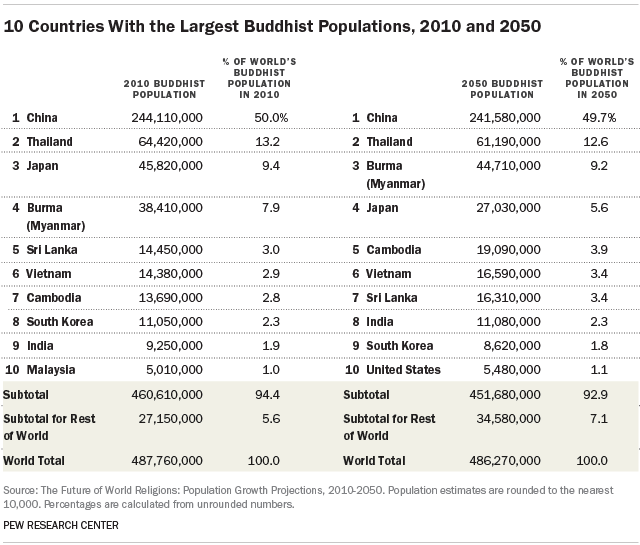 Due in part to projected immigration, the United States is expected to go from having the 13th-largest Buddhist population in 2010 to the 10th-largest in 2050, when it is projected to be home to 5.5 million Buddhists. 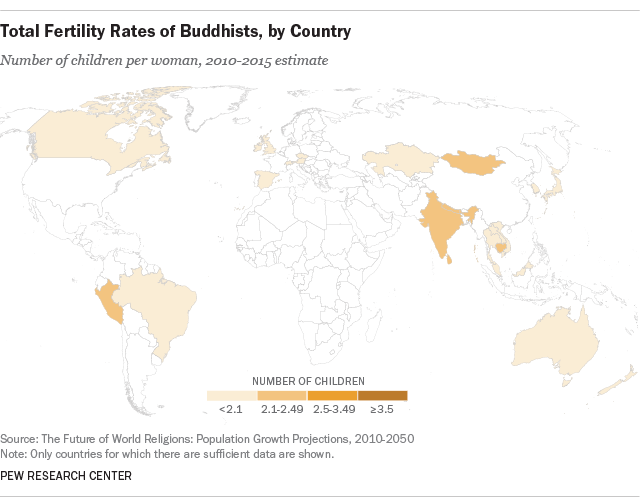 With a Total Fertility Rate (TFR) of 1.6 children per woman, Buddhists have considerably lower fertility levels than the world’s overall population in the 2010-2015 period. Indeed, the TFR for Buddhists is below the replacement level of 2.1 children per woman (the number considered necessary to maintain a stable population, all else being equal). In the Asia-Pacific region, where most Buddhists live, the TFR for Buddhists is 1.6, compared with 2.1 for the region overall. The countries with the highest Buddhist fertility in the 2010-2015 period (Cambodia, Mongolia and Peru) have fertility rates that are only slightly lower (2.4 children per woman) than the global average (2.5). However, Buddhist fertility is very low in such countries as South Korea (1.4), the United Kingdom (1.4), Japan (1.3) and Brazil (1.1). 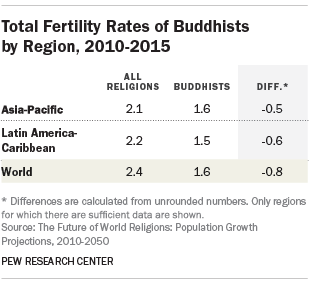 By 2050, the fertility rate among Buddhists is expected to rise in some countries, but it will not have reached the replacement level worldwide. In the Asia-Pacific region, the median age of Buddhists in 2010 (34) was five years older than the median age of the population overall (29). By contrast, Buddhists in North America (median age of 30) are considerably younger than North America’s general population (37) as of 2010. This is largely due to a high number of young Buddhist immigrants and their children living in North America. North America is the only region where sufficient data were available to project rates of religious switching into and out of Buddhism. In this region, the Buddhist population experiences a net loss of members when religious switching is taken into account. 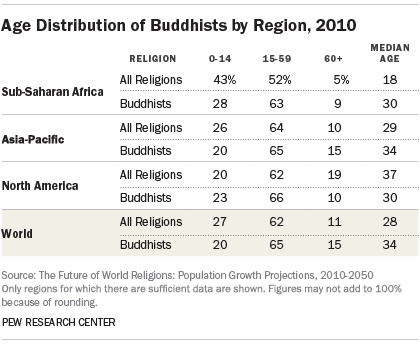 Consequently, the projected number of Buddhists in North America in 2050 (6.1 million) is slightly lower than it would be if religious switching were not factored into the projections (6.7 million). The limited data available on religious switching among Buddhists were factored into the main projection scenario for this report. In an alternative scenario, no religious switching was modeled in any country. 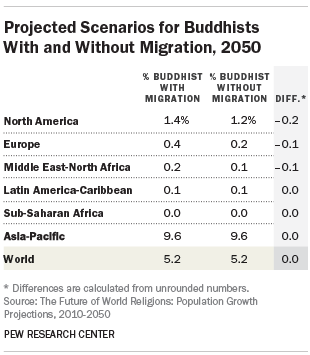 A comparison of the two scenarios finds that at the global level, religious switching makes little difference in the growth projections for Buddhists. The impact of migration on Buddhist populations in different regions can be seen by comparing results from the main projection scenario, which includes expected migration patterns from 2010 to 2050, with an alternative scenario that does not attempt to take migration into account. 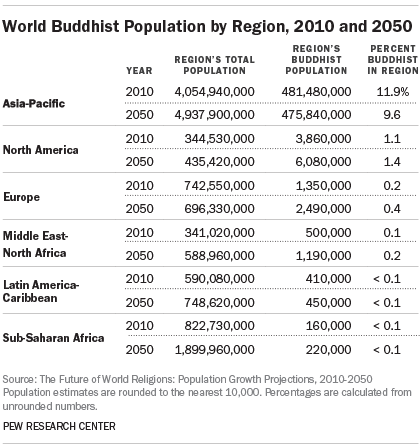 Buddhists are expected to make up about 1.4% of North America’s population in 2050. In an alternate scenario that does not take migration into account, the Buddhist share of the region’s population is forecast to be slightly smaller (1.2%). Similarly, when migration is taken into account, the expected share of Europe’s population that is Buddhist – while still very small – is twice as large as in the alternate scenario that does not include migration (0.4% vs. 0.2%).